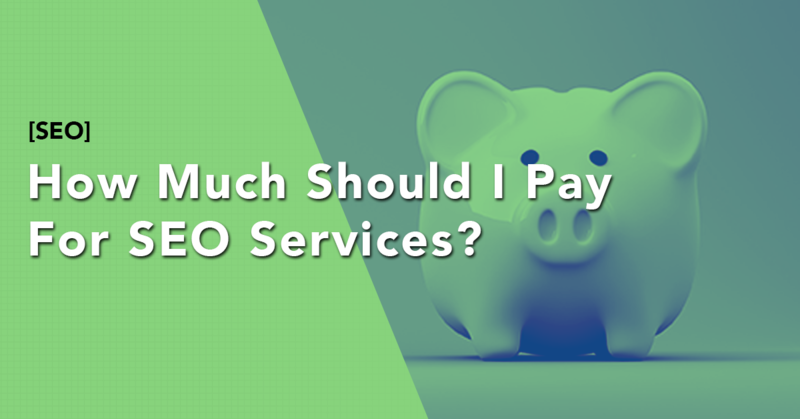 “How much should I pay for search engine optimization (SEO) services?” A question I get asked constantly. I wish I could end this post here and just give you a number but it is not that simple. Nothing is ever that simple, right? The monthly amount you should spend on SEO depends on a number of factors. However, before we get into those, it is important to make the following point clear. Don’t Ever Pay Too Little For SEO. What do you mean? Why not? Well pay attention. When you are paying someone to handle your business’s SEO, it is important to understand what you are paying for. In order to understand what you are paying for, it is important to have a basic understanding of the 3 different types of SEO. There are three types of SEO: Black Hat SEO, Grey hat SEO, and White hat SEO. I am going to break them down quickly below, but I will write an article in the future that goes into more detail. Black Hat SEO is like the black market for search engine optimization. And just like the black market, you should never buy SEO services from anyone that practices Black Hat SEO. Why? Because the penalties of having duplicate content or suspicious links can cost you greatly with search engines like Google – resulting in potentially thousands of dollars in lost business. What if I have purchased Black Hat SEO in the past? If you have ever bought what you think to be Black Hat SEO services in the past, you should get in touch as soon as possible. Together we can analyze your current situation and come up with a strategy that will get you back on track. It is possible to nullify the effects of Black Hat SEO if you have not yet been penalized by Google or another search engine by disavowing the black hat links and removing any sketchy content on your website. Action should be taken immediately as waiting could result in penalties from Google that could last an indefinite amount of time. Let’s talk and get to the bottom of the Black Hat SEO that has been used on your website. On the opposite end of the spectrum is White Hat SEO. White hat SEO services are the law-abiding SEO techniques in the minds of search engines like Google. White Hat SEO is based on creating quality content on your web pages and blog posts. Then getting meaningful and logical backlinks pointing to your website. This is done through ethical link building. Grey Hat SEO is somewhere in the middle of Black Hat and White Hat SEO. It typically involves the process of buying backlinks (which is frowned upon by Google and is punishable if discovered) from a website. The reason why these backlinks would not be considered Black Hat SEO is because the link comes from a credible website that is in some way relevant to the website that it is linking to. This is considered Grey Hat because while it is discouraged by search engines like Google, it is (at this point) nearly impossible for search engines to know whether or not a link is paid for. The best advice is to stay away from Grey Hat SEO. While you can get away with it now, you never know what Google update could come out in the future that could heavily penalize your website. It is best to always stick to White Hat SEO strategies. Where your website currently ranks for a keyword plays a major role in how much SEO services will cost. This is because the amount of effort to get a website to the #1 position would be substantially harder for a website ranking outside of the top 100 versus a website that is already in the top 10. The competitiveness of keywords that are relevant to your business varies by industry. Typically, keywords are more broad or have a higher search volume will be more difficult and therefore take more effort to rank for. 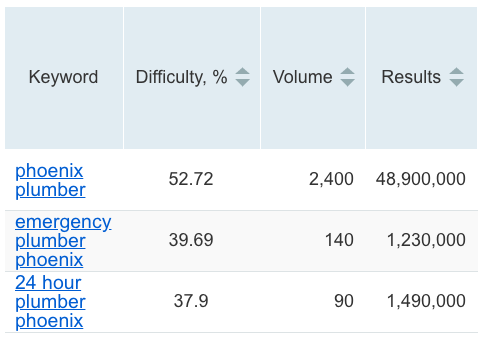 If we look at the results for keywords relative to plumbers in Phoenix, AZ, you will see that ‘phoenix plumber’ has the most monthly volume at 2,400 searches per month but it is also the most difficult at 52.72% (based on a 100% scale). Whereas, the other keywords have a lower volume but would be easier to rank for. It is also possible for other factors to play a role in the keyword competitiveness. For instance, ranking for Tempe SEO or SEO Phoenix is quite difficult because of the high level of SEO tactics that everyone in the industry is using. The ‘Google Sandbox’ is Google’s way of determining the credibility of a new website. It is like a probation period for your website. In order to start ranking and get out of the ‘Sandbox,’ you have to prove to Google that your website is valuable to searchers. Until authority is proven, Google has been known to sometimes delay rankings of a new website or page. The exception to this rule would be if you hired someone to set up only a few basic local SEO components. While I still wouldn’t recommend going this route because the results could be slim to none, it is a potential option for somebody in a niche where the return on investment of a multi-month SEO campaign doesn’t make sense. My SEO Base Package starts at $600 per month. You can check out my SEO Packages Here. One way that you can determine the right price range for SEO services is through calculating the potential ROI of ranking #1 in Google for your best keyword. I have designed a handy dandy SEO ROI Calculator that you can use if you would prefer. Otherwise, I will walk through the calculation below. This is the estimated number of searches done for your keyword each month. You can find this by using a free and easy tool like KWFinder.com. Once you have this number, write it down. Next we have the clickthrough rate which is the percentage of searchers who will click on the link to your website based on where you rank. The CTR percentage for the #1 spot on the search engine results page (SERP) of Google is roughly 25% when combining both desktop and mobile searches. This is the percentage of users that visit your website that become customers or clients. This can vary depending on industry, but I have typically seen numbers between 1 – 4%. Use your best judgement based on your industry. Lastly, we have the lifetime value of adding one new customer or client. Basically, how much is a new client worth to you? This is a number that you should understand in some capacity. If you are completely unsure of what this is, do some research as it is an important number to know no matter how you are marketing. Here is a good article on determining customer lifetime value. Alright, time to put it all together. Multiply your numbers together to determine your potential SEO return on investment. To demonstrate, I will pretend I am a landscaper in Phoenix, Arizona. My goal is to get my website ranking #1 for ‘landscaping phoenix’ so I am going to take the 25% from above and add it to my equation. A simple search on Google tells me that the Customer Lifetime Value (CLV) for landscaping can be anywhere from $1200 – $4800. Let’s be safe and just take the middle ground and call our CLV: $3000. So a user that visits the website and converts into a customer is worth $3000 to me. So our estimated potential return on investment of SEO is $12,000 – $48,000 per month. Again, if you don’t want to do the calculation on your own, check out this SEO ROI Calculator. Like I said before, I can’t tell you how much to spend on SEO. There are too many factors that determine the proper cost. What I can tell you is that by determining the potential ROI for your industry and your best keywords, you will gain an understanding of the possibilities. To reiterate, don’t spend too little on SEO. SEO is an investment. There are a ton of people and services that will promise you ‘quality backlinks’ for $5 (I’m looking at you, Fiverr) but are full of sh*t. What you are actually getting are bad links that will either have 0 effect or could hurt your website’s rankings. I know that there is temptation to try it (I have been there) but the risk is not worth the reward. While I gave you an amount that you should not pay less than for SEO, I am not going to give you a ceiling that you should stay under. Why? Because such a thing doesn’t exist. What if I told you that I could generate $1 million in revenue for you but it would cost you $100k, would you do it? I really hope your answer is yes. That would be a 10x return on your investment so you would be crazy not to do it. When it comes to marketing your business, it doesn’t matter how much you spend. What matters is the return on investment. So really it is up to you. You have to decide whether or not you are willing to spend $X in order to make $X. If your business is struggling or you want to increase and improve the online presence of your business, schedule a call with me. Together we will see if SEO is the right strategy for your business. 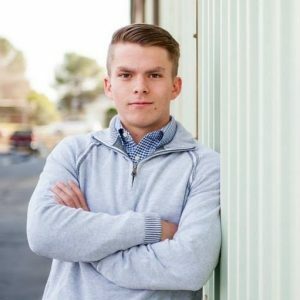 How much are you willing to spend on SEO? Let me know in the comments.